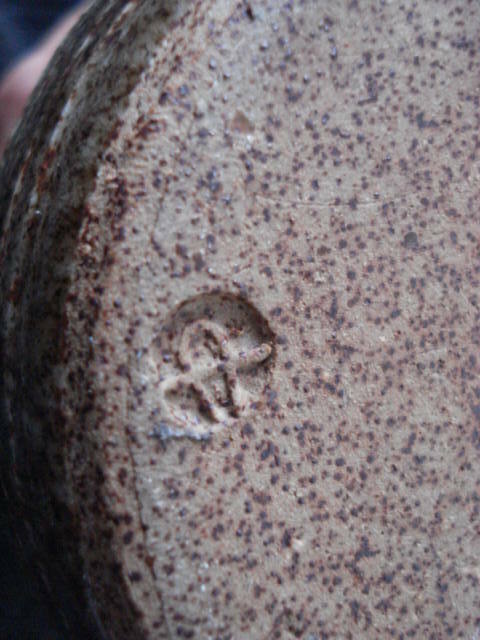 I always get an uneasy feeling when I see a pot with a mark attributed to someone when I don't have any idea who the potter is. When the PottersMarks site was running there were really just a few marks that I had attributed but had no idea or proof of the potter, it was just what I had been told and no body had questioned it so it stayed. Two examples that come to mind are potters Mike Truebridge, and Barbara Cunningham. If these potters actually existed and made the pots with their attributed marks why is there no record of them in the potting books and articles given that both potters work are found throughout NZ. Truebridge with the wine bottle and cups and Cunningham with the smaller pots...... I feel uneasy, did I mention that? It is true that I have other examples of pots and potters who have work around the country with no real knowledge of the potter, but in these cases, I actually found the potter and that uneasy feeling went away. In my mind I had solved the puzzle to a certain degree and felt comfortable about it...almost like the official seal of approval had been given. I guess when selling pots a name may improve the rate of sale....but this is misguided and often not true....I feel it's taken from the fine art syntax, identify the artist....puff out the bank account. It's misguided because you only have to look at the prices realized for NZ domestic ware, in general these are quite low and almost always it is the top potters who manage to score the $5 bid. The lesser known potters haven’t got a chance. Well that’s the way if feels anyway. In the museum in Amsterdam that houses Rembrandt's 'Night Watch' one gallery is dedicated to this work. There are a captions describing the painting and setting the socio-economic context in which it was created. Seems the more status you had the nearer the centre, the bigger and the more brightly lit you were in this portrayal of a privately funded neighbourhood watch group. One of the labels discusses the value of the piece - along the lines of "We are often asked "How much is it worth?"...." The label describes the workings of the art market, the relationships between dealers, collectors, investors etc. It goes on to say that as the painting is owned by the people of Holland it will never be sold and is not part of the market so therefore has no monetary value. It finishes by saying that were it to be sold it is estimated to be worth Lebenty Squillion Guilder or some such. First and possibly only time before Tim's post that I've seen a semi-public discussion of value, worth and cost applied to creative works. Not even sure if that particular label is still there. Tim...... are you saying that Barbara Cunningham's mark may not be correct? You are uneasy because you haven't had that verified? Was it on the NZPotters marks before your site was up? Hi ev I never got that mark verified, either I couldn't find the potter or I forgot to look. I remember when I was told about that mark. It was a dealer who had a stall at the local markets, he had either met the potter or knew someone who did. The thing is five years ago there wasn't the information there is now, and back then you had to take the info anyway you could get it. Over time errors tended to correct themselves. Names were corrected, marks rotated etc. Very similar marks sorted...but that particular one just stayed as it was...so it was a bit like a theory and considered correct until proven wrong. And on the whole this seemed to work pretty well. Until of course the website stopped. The flow of info stopped then and so that's why I feel uneasy. The last mark to be fixed was one for Peter Alger...the clover mark. That was fixed on the website, but not in the book. Tintagel Pottery seemed to use a clover mark too...so some confusion resulted until time fixed things. The clover leaf published in the book is a Peter Alger mark...an early one. The clover mark Tintagel used looks different. Confused ? 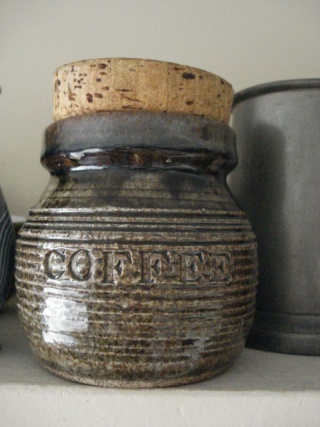 No it wasn't on the NZ potters site, is it on it now? I don't have access. Do NZPInc members ever question the database? I'm an outsider so pretty much out of that loop. Tim - as you know all of the marks that the NZ Potters Society obtained, were by the method of the actual potter filling out a marks form, and details like when they began potting were included. I am not a member of NZSP but a group that I belong to is a member. I could ask on the NZSP forum if anyone knows/knew Barbara Cunningham and see if they can make sure that the mark in the NZSP marks book is actually hers...... ? Might be a good idea ev, but I never see much traffic on the NZP forum. I could probably track down the person who originally told me......but that would mean I was in the pottersmarks business again! I want to know how someone with that name can come up with a mark like that now. could this be barbara cunninghams mark?